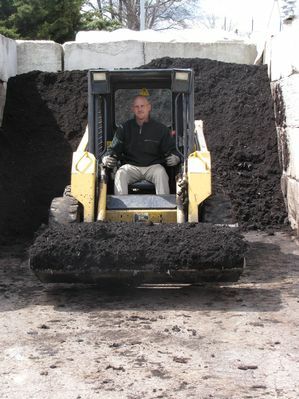 We offer 2 kinds of bulk mulch for delivery as well as bulk top soil. Minimum 4 scoops for delivery. Delivery rates are zip code based. We are happy to take orders over that phone with credit card, sorry no COD. Call today to schedule you delivery 454-4000! 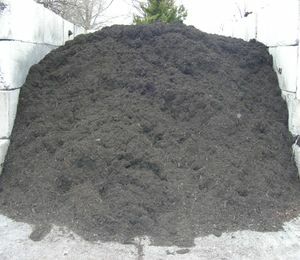 One scoop of any of our bulk mulch covers 75-100 Sq. Ft. approximately 2 inches deep. One scoop is equivalent to 10-12 bags of mulch. We offer bulk mulch in 2 varieties: brown hardwood and black hardwood. We also offer bulk topsoil by the scoop. Before you start mulching we recommend you put down a granular weed control to keep weeds from sprouting. Weed granuals will not harm existing plants they only work on seeds. We recommend weed control granuals instead of weed fabric for all mulch applications except for gravel. Brown Hardwood- Our Brown hardwood mulch is our most economical mulch. Chocolate brown it gives a natural look to any landscape. Black Hardwood- This mulch is similar to the brown hardwood in texture but its coal black color sets it apart. Died black this mulch really contrasts with colors of plants to give that manicured landscape look. Topsoil-Screened clay topsoil is great for filling holes, raising or making beds, leveling lawns and more. 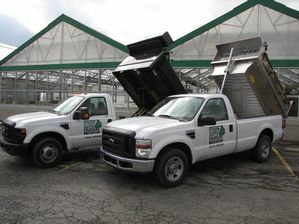 We dump mulches and top soil on paved surfaces we do not drive in or through yards. Dump sites need to be as flat as possible to insure safety of dump. We recommend putting down a tarp where you would like mulch/topsoil dumped to cover it incase you do not get it all put down in one day. Although we have a minimum of 4 scoops for delivery we have they ability to bring up to 8 scoops of topsoil and 12 scoops of mulch. If you need more there will be an additional delivery fee. For anymore questions or to schedule your delivery please call 454-4000. Don’t need quite the much mulch? If you have a pick-up truck you can pick up the mulch or topsoil yourself. We will gladly load your truck for you. We sell mulch and topsoil by the scoop, sorry we don’t do half scoops.